Nordlek 2012 is an iPhone/iPod application that shows dance and music material for the folk dance festival Nordlek 2012, to be held in Steinkjer, Norge, July 10-15, 2012. Se www.nordlek.no for information about the festival. 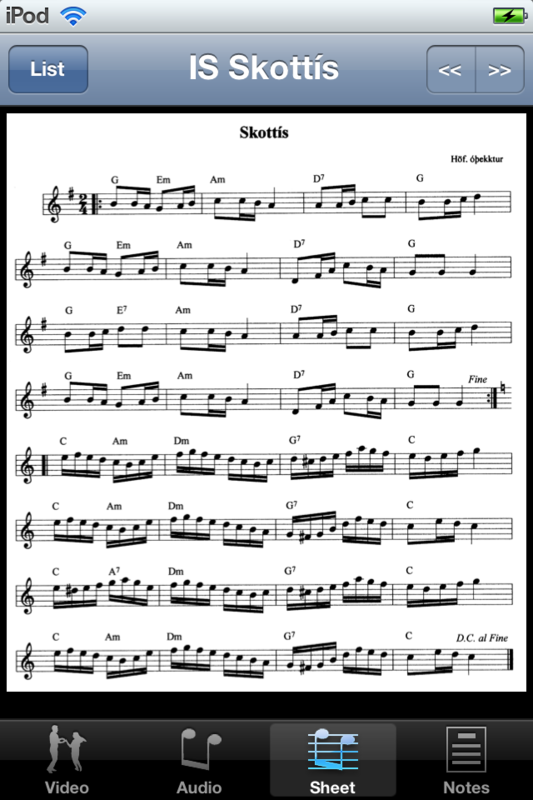 The application contains video, audio, sheet music, and descriptions for each country's dance and tune. It also contains the VI-KAN (We can do it) dances. Many of the dances have all four media types. However, occasionally some are missing such as a separate audio track. For the Faroe Islands dance, the audio track is a separate video with background information about the song. The tunes have only audio and sheet music (no video or dance descriptions). Media files have been adjusted to suit the iPhone. However, the application still contains a lot of data (186MB), making it necessary for the iPhone/iPod to be connected to the internet via Wi-Fi in order to download. The advantage is that the video can later be played without an internet connection. When the application starts, it shows the list of dances in three groups: dances, tunes, and VI-KAN dances. When a dance in the list is chosen, the video player is shown (if the dance has video) and you can begin playing it. Tap another media type to see other media for the same dance. Tap << or >> to go to the previous or next dance in the same group. 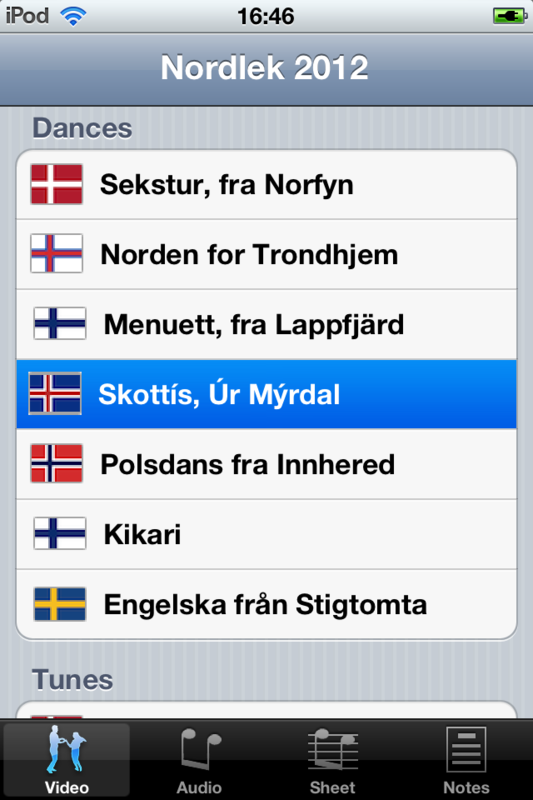 Dance descriptions can be shown in a Scandinavian language or in Finnish by tapping SK or FI at the upper right. You can go back to the list by tapping List at the upper left. The media type can be changed while showing the list - the dance will be shown when you choose from the list. If a dance has video without separate audio, the video will be played for the audio track. This makes it easier to use the audio for dance practice. Audio and video continue to play when you show the sheet music or dance description for the same dance. This lets you listen to the tune while you study the music or description. With an iPad or newer iPhone (from iPhone 4), you can play the video on an external screen using Apples VGA Adapter. This can be used to show dance videos to a group of dancers. The application will run on the oldest iPhone models since the minimum requirement is iOS 3.1. However, it functions slightly differently on old models, such as always showing video in full screen and landscape format. Send comments and questions to Semafor Software, post@semafor.no.